Robert Currie, made an expeditionary first raft descent in 1991 and figured out how to safely navigate what today is one of the most intensive stretches of commercially run white-water in the world. Experience level: Our activities are carefully designed to be enjoyed regardless of age or previous experience. 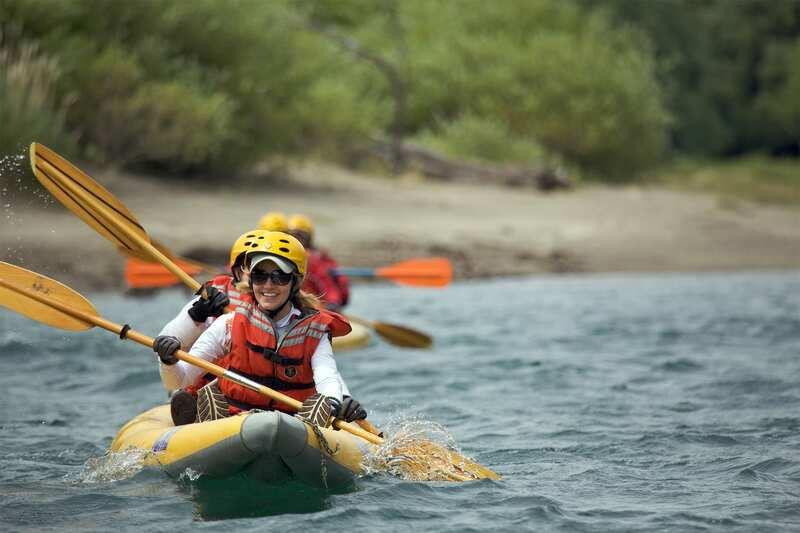 You will be able to go rafting, kayaking or doing other multisport activities. 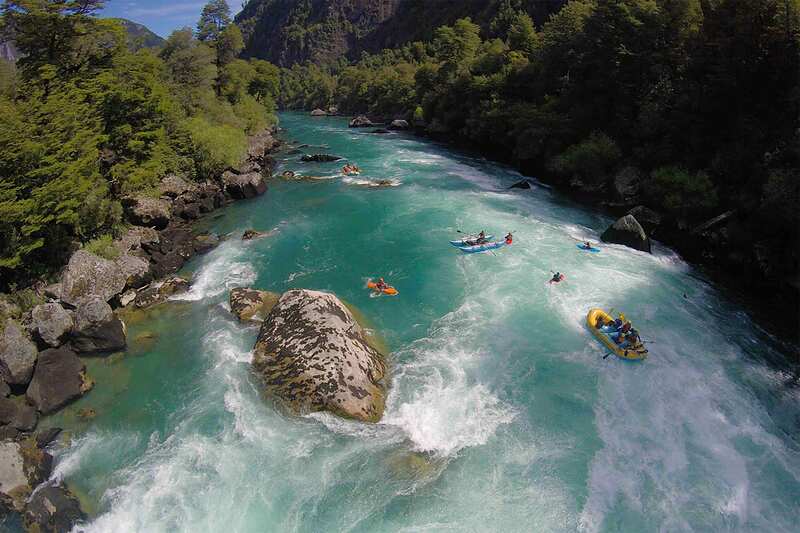 This adventure takes place on the world class Futaleufú River, located in northern Patagonia. Consistently ranked as the top whitewater river in the world. 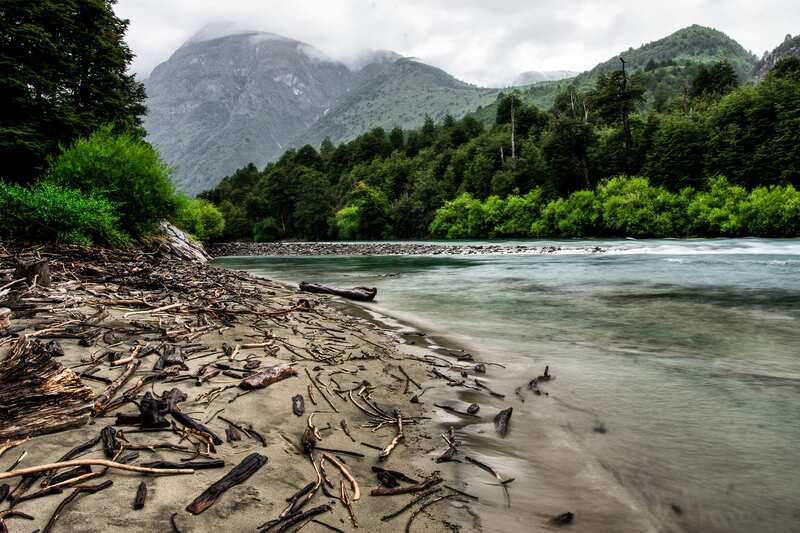 The river is fed by glacial snow melt in the Andean lakes region of Argentina and Chile. This rafting trip is a unique experience in the area. Our private camps in key locations will give you the opportunity to experiment each of the activities from a privileged place. Designed to be in tune with the environment, these camps will surprise you with unique features and amazing views. Multisport activities will enrich your trip, each one as a part of a masterful composition, full of emotion, beauty and adventure. 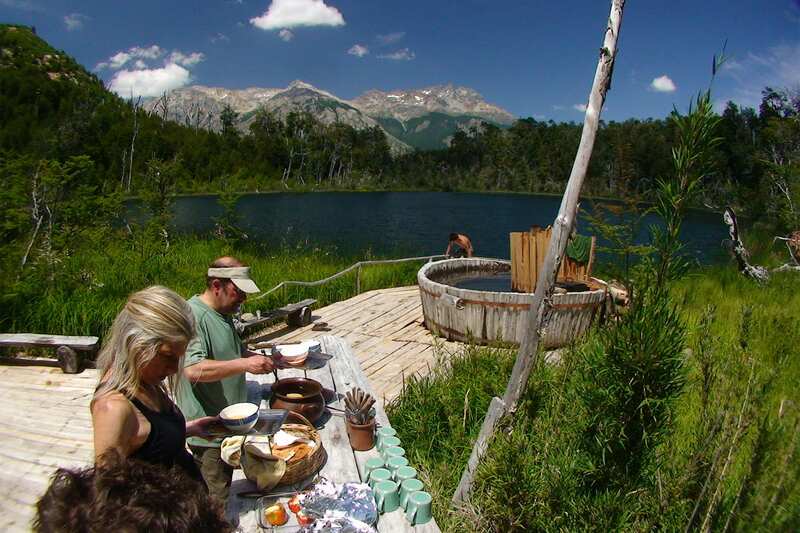 Each night you will enjoy a delicious meal and relax at the camps hot tubs, while we share anecdotes of this unique part of Patagonia. Our meeting point is the town of Esquel in Argentina. During the day, explore its streets and get ready to start a great adventure. In the evening, gather for a welcome dinner. We'll start the day with a one-hour drive to the Chilean border. 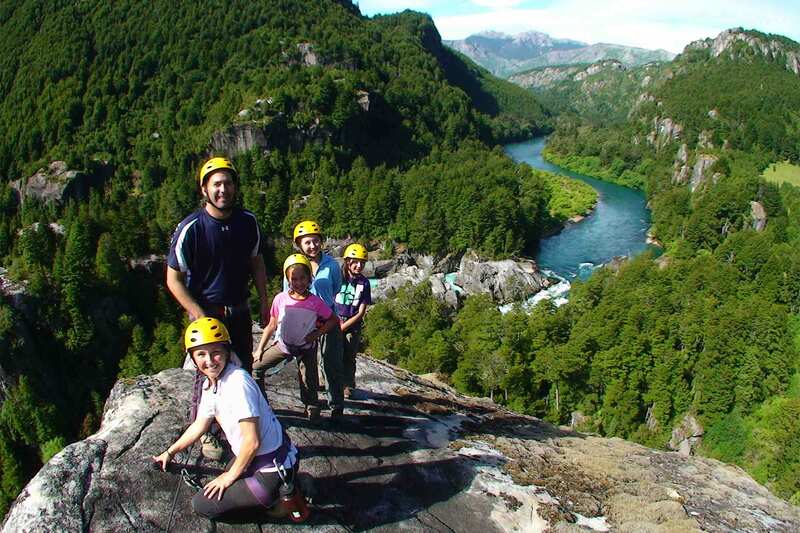 Once at Futaleufú, you will see how the landscape changes as you enter the heart of the Andes. The contrast between the snow-capped peaks, the green vegetation, and the crystalline water of the river is an impressive spectacle. Later, you'll take part in a rafting orientation. A very exciting section of the river will allow you to train and prepare for the challenges of the rest of the week. After all the action, head to the camp to relax and enjoy a good meal, as well as the hot tub overlooking the rapid known as "Terminator." Start the day by paddling a kayak down the Espolón River, a perfect place for beginners. Paddle until reaching the lunch spot. 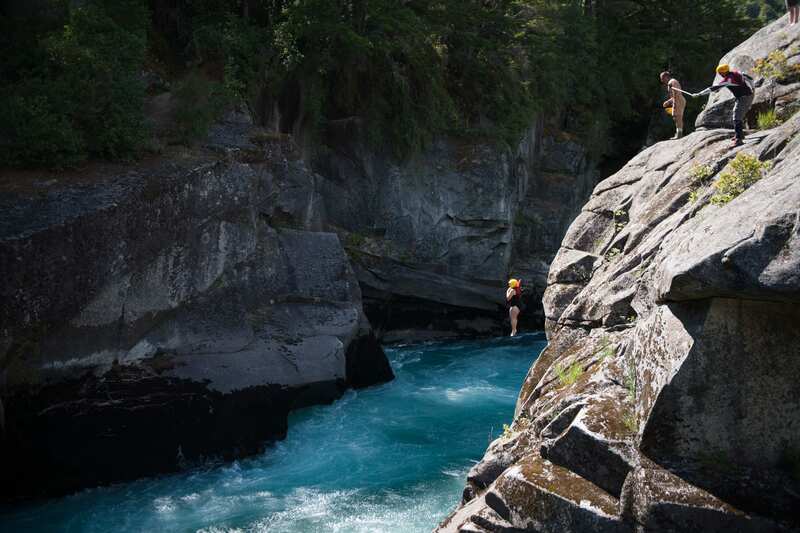 Then, switch to the raft and enter one of the most challenging portions of the river, Inferno Canyon. This striking canyon has impressive Class 5 rapids - as exciting as they come! Spend the night at Cave Camp. After arrival, there will be time to explore and enjoy its many features, including a little blue lake, a sandy beach, wooden and stone hot tubs, and much more. This morning, a stunning trek leads to the next camp: Tree Houses. 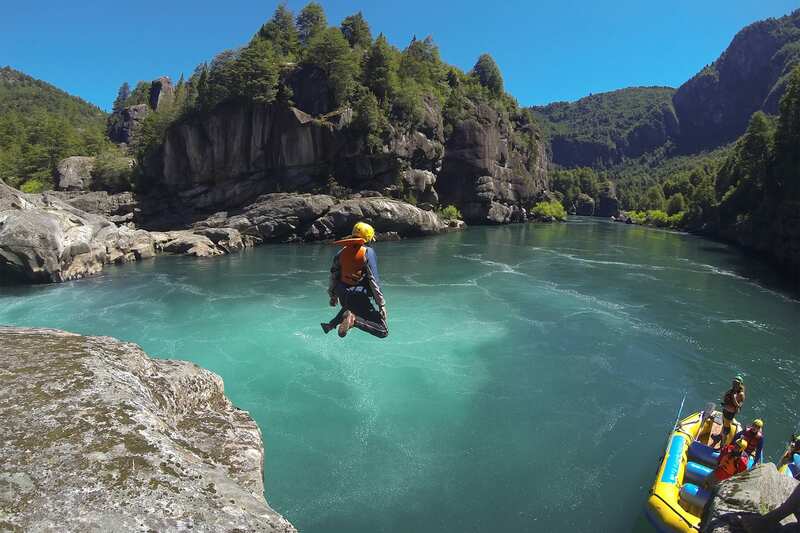 On the way, cross the Futaleufu River on a pulley system suspended over the most dramatic rapid of the river. On the other side, start the hike to the camp, enjoying spectacular views along the way. Tonight's camp is a unique place with a series of tree houses interconnected by bridges. Have lunch here and take a swim, go kayaking, or relax at the hot tub right next to the lake. There's also the option of hiking up to Condor Hill, where condor sightings are very common. Condors are typical birds of Chile, with a wingspan of over 10 feet. 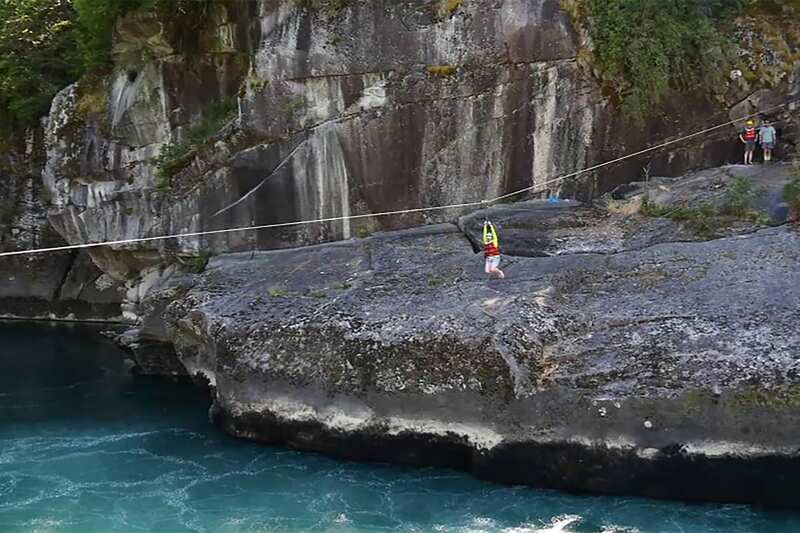 After hiking back to the banks of the river, “zip” across through a pulley system that will see you flying through the air and sliding over the river. You can also jump into the river from different heights--as high as 40 feet high--for the exciting adrenaline-rush of a free fall. In the afternoon, go climbing to reach the top of a rock formation, from which you can enjoy spectacular 360º views. 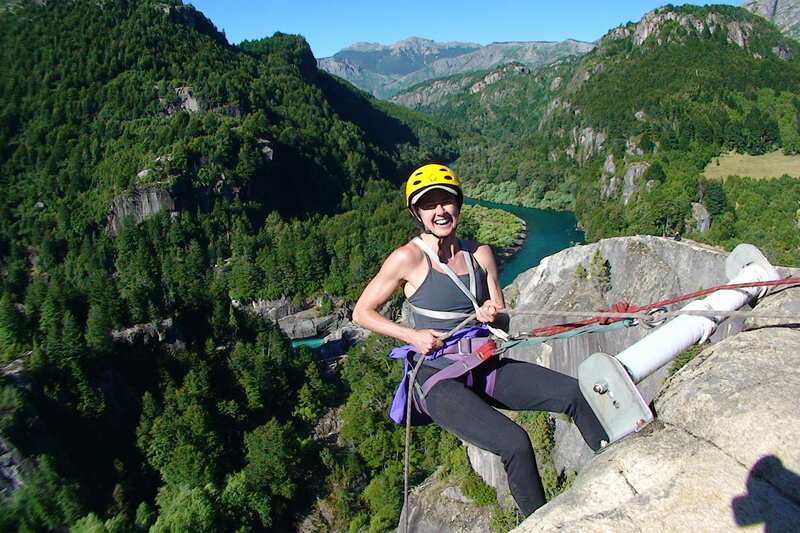 Then, rappel off a 300-foot granite wall. The climb has been carefully designed to be suitable for people of all ages, and it has different levels of difficulty you can choose from. Finally, relax in the hot tub overlooking the river, and have a large dinner to recover your strength for the next adventure-packed day. Make an early start for a full day of water activities. 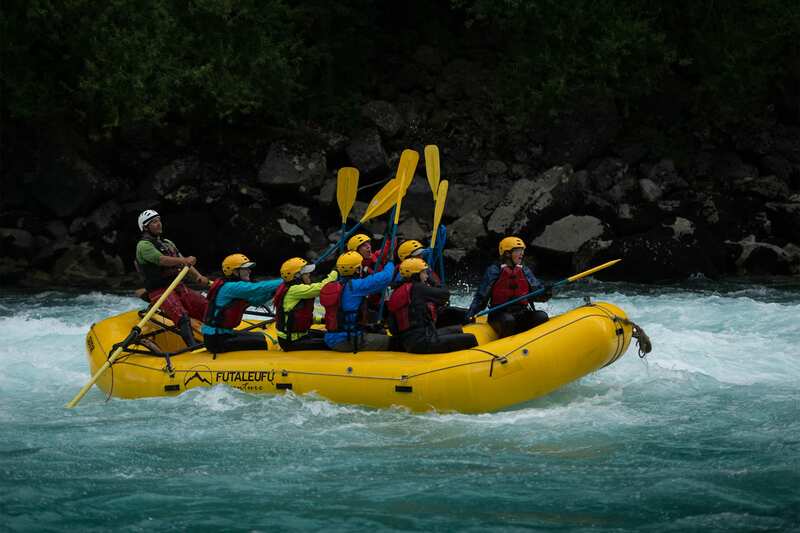 In the morning, raft an entertaining section of the river with Class 4 and 4+ rapids, until reaching the lunch spot. 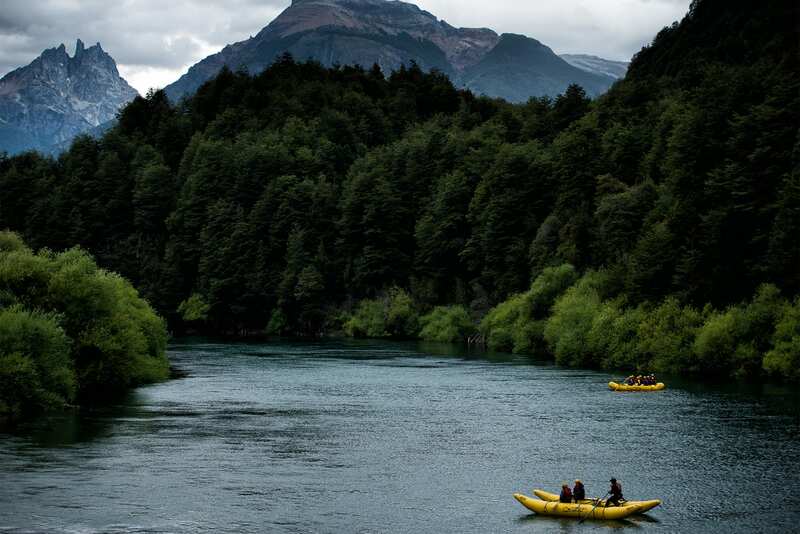 In the afternoon, after a short hike, use inflatable kayaks to go down the Rio Azul through a beautiful canyon until it meets the Futaleufu. From there, continue kayaking until reaching the next camp, called The Nuns. In camp, take time to relax and enjoy the cliffside hot tub overlooking the river and its landmark mountains, the Nuns. After stocking up on energy with a good breakfast, you will go canyoneering in the Arroyo Blanco (White Creek). The creek runs through a spectacular canyon of white granite and turquoise water, which you will traverse on foot until reaching a waterfall. 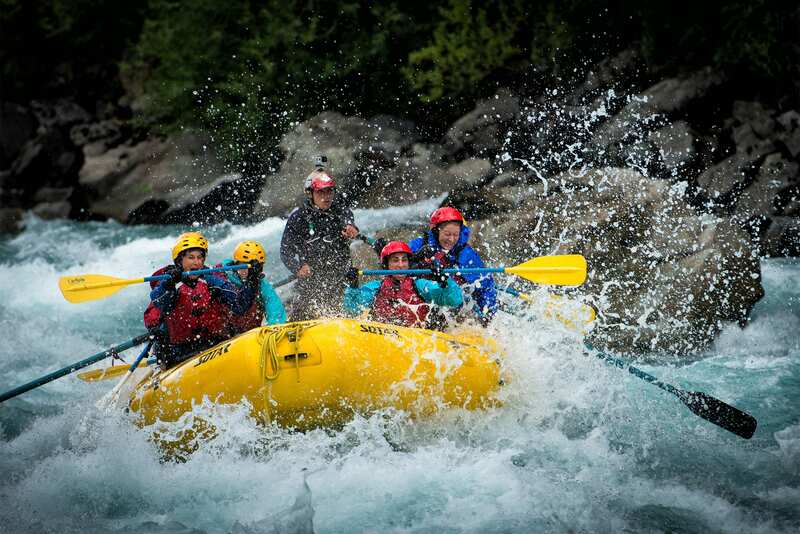 Then you will face the biggest whitewater day of the trip! 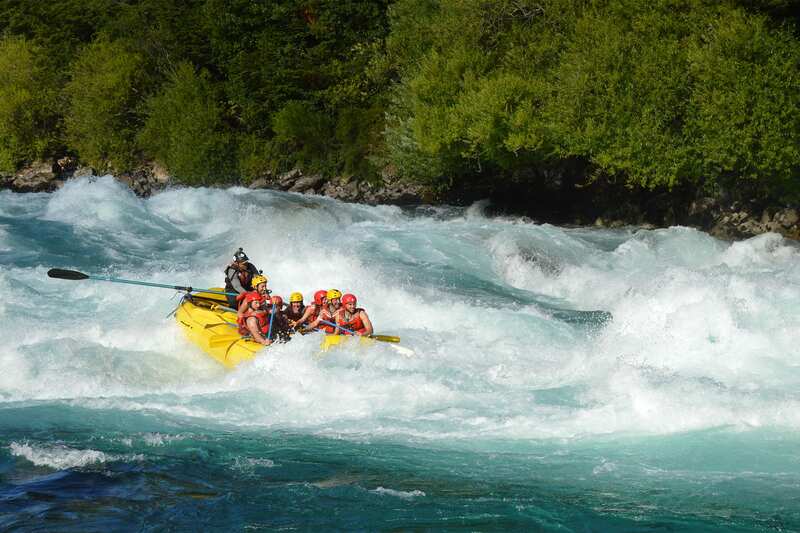 Start by rafting one of the most famous rapids of the Fu': Terminator. 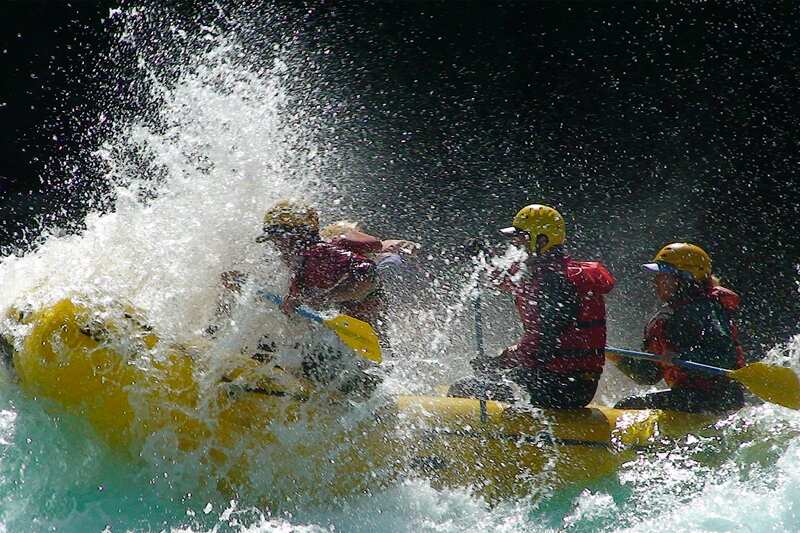 Then, continue with a series of highly entertaining and challenging rapids, until reaching the lunch spot. After lunch, keep rafting until the rapids are finally over on this incredible river. It will be an action-packed experience full of excitement, adrenaline, and fun! After an intense day on the water, return to the Nuns camp to relax and enjoy a well-deserved Patagonian asado (lamb barbecue). 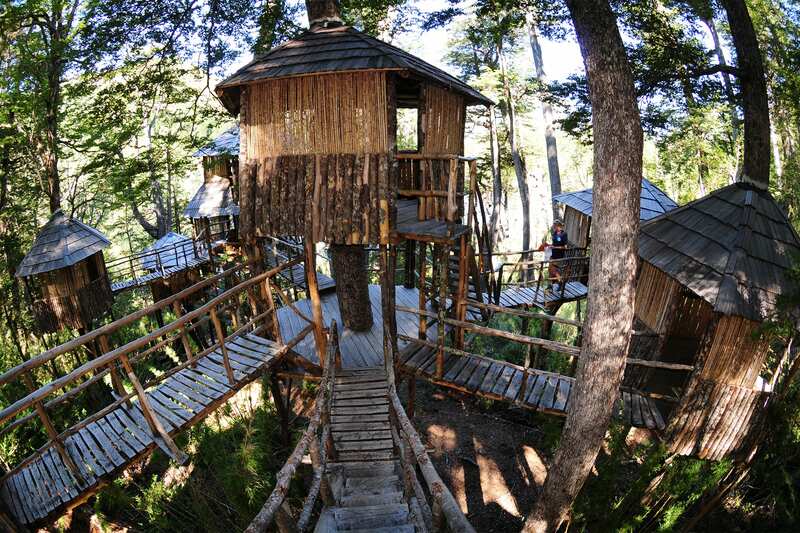 From the Nuns Camp, drive to the Esquel Airport to catch your flight back to Buenos Aires. Along the way, enjoy the scenic beauty of the area before departing. *Note: All our activities are suitable for all ages and can be performed at different level of difficulty. Also, most are optional. The trip includes everything from meeting point: first night at the hotel and welcome dinner, transportation to Futaleufú, all meals during the adventure, sleeping accommodations in 4 private camps, all multi-sport activities (rafting, kayaking, trekking, climbing&rappel, zip-line, tyrollean, canyoneering) and transportation back to Esquel airport.